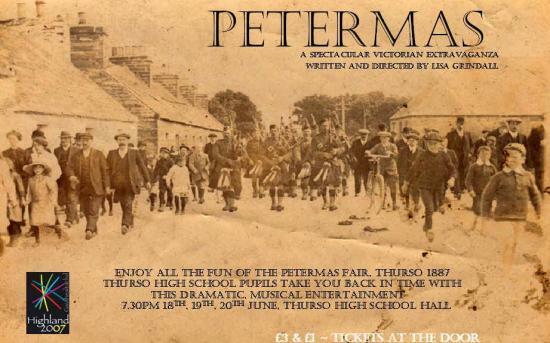 Don't miss "Petermas" - a dramatic and musical re-enactment of a day at the Petermas Fair which was one of the highlights of the calendar in Victorian Caithness. Written by drama teacher Lisa Grindall, the play incorporates strands as diverse as the legend of the Selkie (creatures that can transform themselves from seals to humans), the Ceilidh and the Petermas Fair, to tell a tale of Caithness in the Victorian era. The event will involve pupils from all the years in the school and will include music (devised and performed by the music department and S1 pupils), dancing, piping, puppetry and acting. The event is part of the school's contribution to the Highland 2007 initiative and will see performances for local Primary Schools and the public. This is a chance to learn about some of the strands of Caithness legend and history in an exciting dramatic form packed with music with a huge cast that only the West End In London could afford. There is somethng for everyone in this show. So get along to a live show in Thurso and get your tickets soon as demand is expected to be high. Tickets are on sale at the door priced �3 and �1.